Beautiful foliage and edible fruit make this a must in most gardens. The new growth is bronze and the berries are blue to black. Does not transplant well, but can be grown easily from smaller potted stock. Can be hedged. 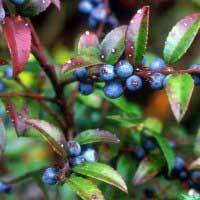 For more information, check out the article about huckleberry under Plant topics.